Whilst stratton has an established reputation in car finance, some of the more interesting stories behind the things we've financed come from our Commercial team. We've helped farmers, franchise owners, horse breeders, medical centres and many other businesses fund the growth of their business. If you run a business, we'd love to speak with you - get in touch here. For everyone else, we thought you'd enjoy some of our most interesting success stories. Who says finance can't be delicious? The Target: Burger restaurant fit-out in inner Sydney. The Challenge: Organising the financing of labour and installation costs to free up funds for working capital. Enter stratton: The stratton consultant (who happens to have a history as both a restaurant and bar owner) was able to finance everything from the food prep areas, to the ovens, all the way down to the labour involved in the construction. By financing the fit out, the business was able to free up capital to use for the launch and promotion of the new restaurant. Need a new business fitted out, or just want to talk burgers? Give our Commercial team a buzz. The Target: FUSO Fighter 1627 in the Ports area of Melbourne, Victoria. The Challenge: Because many new businesses fail within the first 12 months of operation, lenders don't always share the same passion for start-ups that we do. 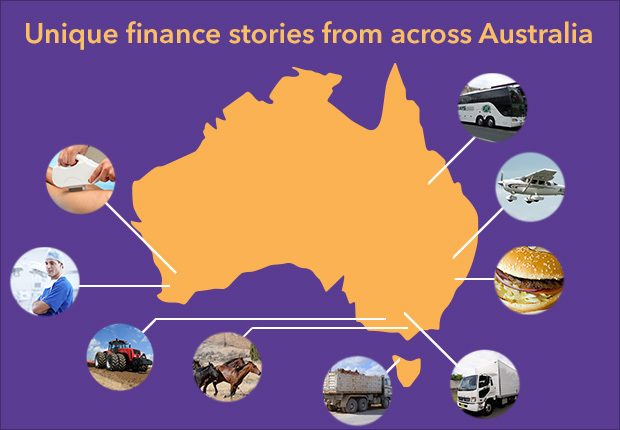 Enter stratton: By working with the owners to create a business plan, finding the right truck for their needs and organising a great finance deal, our Commercial team was able to get a FUSO Fighter financed for a newly-established Melbourne transport firm. In the months following the settlement, the business was able to grow their fleet by three trucks. Want to speak to the team that made it happen? Give us a ring. The Target: Airseeder in rural Victoria. The Challenge: The client had previously been rejected for a loan by a bank because he didn't own property. Enter stratton: By preparing cash-flow projections, work source letters, and highlighting the incremental income that would come from the purchase of the Airseeder, stratton was able to detail to the lender why the client was suitable for financing. The Target: School buses in regional Queensland. The Challenge: Support the purchase of three buses and the application for a government-contracted regional school run. Enter stratton: The stratton Commercial consultant (with a handy history in supplying parts to the bus industry) was able to travel to Queensland to meet with the CEO and assist in purchase negotiations, consolidate the company's financials, assist in their revenue projections - even support the settlement and delivery of the buses. All in time to take up their school runs. It's not just what you know, but who you know, when getting the most experienced broker in your corner. Are you after service that helps you from the very beginning to the very end, or just need someone to drop the kids off at school? stratton can help you out. Go on, give us a call. We financed the purchase of a thoroughbred horse in country Victoria. We helped a farmer purchase a light aircraft to monitor their property in rural NSW. We helped a builder finance a 1981 Tipper Kobelco Truck in northern Tasmania. We organised the finance of an IPL Hair Removal Machine for a beauty salon in the outer suburb of Perth. We financed the entire fitout of a Medical Centre in the Perth CBD. stratton has the right consultant ready to tackle whatever your business needs, with the knowledge and skills to help get you across the line. Think your business has something that needs finance that we won't be able to organise? Nice try. Submit an online quote or give our Commercial team a call on 1300 738 290 and give us your best shot!